A book—for children and adults alike—of the remembrances of Richard Quinney growing up on the family farm in southeastern Wisconsin in the 1930s and 1940s. 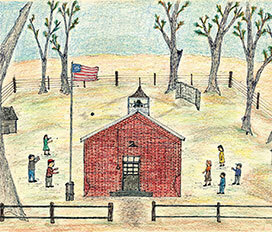 Charming color drawings illustrate the recollections of attending a one-room school, working in the fields, haying on summer days, threshing, going to school on winter days in the bobsleigh drawn by horses, milking the cows in the barn, ice skating and sledding down hill, and waiting for the mailman to bring news from other places. The book is dedicated to Quinney’s brother, Ralph, his companion of those early years on the farm. You remember clearly a few things from the years when you were young, things that happened maybe only once but have lasted a lifetime. These memories have given you the sense of who you are. There is no past in your life without these memories. Your memories are connected to visual images. In your mind, in your imagination, these images are the paths through which you know the early years of your life. Your life is a series of such images. The time may come when you feel the need to make sketches of your visual memories. Your artistic skill will be of little concern. What will matter is the intensity of your need to draw what you remember of your past. That need may come, as it did for me, later in life when your past is crucial to your living in the present. Your past, as now vividly remembered, is helping you to live fully in the present. Your past is part of your present—and is fast becoming your future.